· Sociology as a distinct discipline of the scientific study of society emerged only in the second half of the 19th century. · Hence it is considered as the youngest of all Social Sciences. · The contributions of early thinkers including Saint Simon, Auguste Comte, Herbert Spencer and Emile Durkhiem are immense in the development of this distinct discipline. · Auguste Comte gave an identity to this discipline and hence is considered the father of sociology. · This discipline has a scientific methodology that makes it different from other Social Sciences and commonsense knowledge. Why are you Learn sociology? · Sociology is the study of human social relationships and institutions. · Sociology’s subject matter is diverse, ranging from crime to religion, from the family to the state, from the divisions of race and social class to the shared beliefs of a common culture, and from social stability to radical change. · Sociology aims at understanding how human actions and consciousness both shape and are shaped by surrounding cultural and social structures. · Sociology is an exciting and illuminating field of study that analyzes and explains important matters in our personal lives, our communities, and the world. · At the personal level, sociology investigates the social causes and consequences of such things as romantic love, racial and gender identity, family conflict, deviant behaviour, ageing, and religious faith. · At the societal level, sociology examines and explains matters like crime and law, poverty and wealth, prejudice and discrimination, schools and education, business firms, urban community, and social movements. · At the global level, sociology studies such phenomena as population growth and migration, war and peace, and economic development. · It is the "the vivid awareness of the relationship between experience and the wider society." · To have sociological imagination a person must be able to pull himself / herself away from the situation and think from an alternative point of view. · In the contemporary world, we belong to more than one society. · When amidst foreigners reference to ‘our society’ may mean ‘Indian society’, but when amongst fellow Indians we may use the term ‘our society’ to denote a linguistic or ethnic community, a religious or caste or tribal society. · Inequality is central to differences among societies. Ø Sociology is not the only subject to think about the social life of human beings. Ø Sociological perceptions of society and social life are quite different from philosophical and religious thoughts and commonsense knowledge. Ø Sociology perceives norms and values as they function in actual social context. Ø Sociology follows the scientific method of observation and analysis that can be checked upon by others. 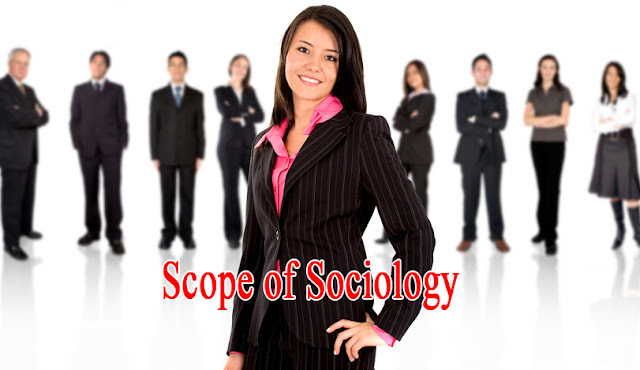 Ø Sociology is the study of human social life, groups and societies. · Common sense is based on naturalistic and individualistic explanation. We can’t find any type of scientific evidence. · A naturalistic explanation of behaviour rests on assumptions. · Sociology breaks away from both common sense observation and ideas as well as from philosophical thought. · Sociology emphasis on scientific procedures can be understood only if we go back in time. · And understand the context or social situation within which the sociological perspective emerged as sociology was greatly influenced by the great development in modern science. · Sociology is a general and systematic social science. · Scope of sociology is very vast. · Sociology studies the various forms of social relationships. · Sociologist follow a path of objective knowledge, free from bias and prejudices. Sociology is closely related to other social sciences. · Economic development influence man’s social life. there exist a close relation between economics and sociology. · Objective of the economic analysis is to formulate precise laws of economic behaviour. · Sociological approach looks at the issue in a broader context of norms, values, practices and interests. · Economic perception suggests a technical solution to the issue, but sociology encourages a questioning and critical perspective. · Political science is the study of the State and the Government. o “State is a territorial society divided into government and subjects, claiming within its allotted physical area, a supremacy over all other institutions”.-Harold. J Laski. · The state discharges its functions through the Government. o The Government has three parts. (a) The Legislature. (b) The Executive and (c) The Judiciary. · Sociology studies the concept of power of the people in social context. o Power is most important aspects of political science. So it tries to study different aspects in acquiring, distributing and maintaining power in the state. · Political problems are often explained and interpreted with the help of sociological principles. · Every political problems as a social background. · Political Scientist provide substantial contribution towards analysis of social problem. · Sociologist study all means of social control, while political scientists confine themselves to the study of governmental control. · Sociology and Political science are interrelated. · The Political parties, election system, political systems, forms of government, political ideologies etc. are shaped and modified by human beings. · The state regulates human behaviour through laws. The state also influences the social, religious, economic, and other activities of man. · Family types, education, beliefs, traditions, practices and so on are shaped by the prevailing political system. · Political life cannot be separated from social life. · Family, religion, education etc are agencies of political socialization. · Based on the interdependence of the two disciplines, a new branch called 'Political Sociology' emerged. · Sociology and History study society from two different angles. · History studies past society. · Sociology is concerned with the present society and to some extent with the future. · The present society cannot be analysed without reference to the past society. · Social history emerged as the result of the mutual relationship between the two disciplines “Social history” is the historical analysis of social patterns, gender relations, mores, customs and important institutions. · Psychology is the scientific study of human behaviour. o learning and memory, sensation and perception, motivation and emotion, thinking and language, personality and social behaviour, intelligence, child development, mental illness, and much more. · Psychology studies the behaviour of an individual in a given context. · Social Psychology studies how individual behaves in groups. · Anthropology is the study of Human race, especially of its origin, development, customs and beliefs. o Physical anthropology:- Biological origin of human race. · Anthropologist used ethnographic research method. While sociologist used survey and questionnaires. · Sociology is the study of modern complex societies whereas Social Anthropology is the study of simple societies. · Social anthropologists rely on participant observation methods whereas the method of study adopted by sociologists is survey and quantitative methods. Home tutors are provided by TheTuitionTeacher in Delhi.